A big innings from Jonathan Trott unbeaten on 169 who was involved in a stand of 89 with Ian Bell (55 not out) took England to 394 for 4 in reply to Sri Lanka’s 400 on the fourth day of the First Npower Test which appears to be meandering to a draw with a day left, thanks to the fickle weather conditions at the time of our going to press, here today. Sri Lanka Army men’s and women’s ‘A’ teams emerged champions in the Inter Club Relay of the Mobitel Relay Carnival 2011, concluded at Mahinda Rajapaksa International Sports Complex yesterday. “Davis Cup Tennis matches will be underway soon,” says Suresh Subramaniam - Chairman of the Selections Committee. “A squad has been chosen and is awaiting approval from the Ministry,” he says. 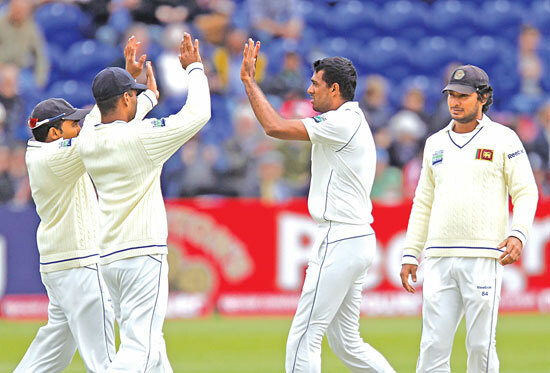 Seven foreign teams are expected to arrive on June 14 to Sri Lanka to play in the qualifying Group Three matches that will be held at the SLTA courts from June 15 to 20, 2011. Sri Lanka which was playing in Group 2 was unfortunately relegated to Group 3 last year when we lost to Hongkong in the play-offs after losing to New Zealand in the qualifying round.